Spectacular scenery will form the backdrop to our search for the endemic Zino’s Petrel and Trocaz Pigeon plus Plain Swift, Island Canary and Berthelot’s Pipit as well as Fea’s and Bulwer’s Petrels, Barolo Shearwater and Madeiran Storm-petrel at sea. The post-tour extension’s three long boat-trips offer further opportunities to see seabirds, which may now include White-faced Storm-petrel. Day 1 Flight from London to Funchal and transfer to our family hotel in downtown Machico, where we will stay throughout the tour. After dinner we will head for Pico do Areeiro. In the dark it will take about half an hour to trek along a path in mountainous terrain to a spot close to the breeding area of Zino’s Petrel. This very special bird was thought to be extinct until its rediscovery in 1969. It was formerly considered to be a subspecies of Fea’s Petrel but now has full species status, with an estimated 80 breeding pairs and a total population of only 400 individuals. We will sit quietly to listen for the calls of Zino’s Petrels; if the weather conditions are favourable we should be able to observe the silhouettes of some of the birds. Day 2 On a morning sea-trip around the eastern end of Madeira we will look for feeding frenzies of seabirds to try to locate Cory’s Shearwaters, Bulwer’s and Fea’s Petrels. There is also a chance of finding a vagrant seabird such as Sooty, Great or Cory’s (Scopoli’s) Shearwater. Normally these feeding frenzies attract Yellow-legged Gulls and dolphins, including Bottlenose and Spotted Dolphins, and occasionally Sperm, Bryde’s, Sei or Fin Whales are seen. The landscape here is spectacular, revealing the geological formation of this volcanic island. After lunch at a local restaurant we will drive to the west side of the island again, but this time to the highest plateau to look for Red-legged Partridge, Common Quail, Common Buzzard, Spectacled Warbler and Pallid Swift. 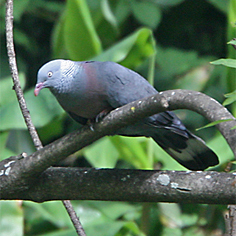 Day 3 Today we will journey to the west side of Madeira, stopping at various places including the Laurel forest in a high valley for Trocaz Pigeon, Madeira Firecrest and the local subspecies of Common Chaffinch, maderensis, followed by a visit to a coastal area for Common and Roseate Terns. After lunch, we will spend about half an hour seawatching from Porto Moniz following which we will visit the island’s most westerly point for Berthelot’s Pipit, Spectacled Warbler, European Goldfinch and Eurasian Linnet. Day 4 Today we head east to Caniçal to look for Spanish Sparrows and the more difficult Rock Sparrows at the eastern tip of the island. We will certainly see Berthelot’s Pipits, Eurasian Kestrels and Plain Swifts during our search. Then we then visit Santana to look for Atlantic Canaries and European Greenfinches. Lunch will be taken at Santana at a restaurant overlooking the sea whilst keeping our eyes out for the resident Eurasian Sparrowhawks. After lunch we will visit Faial to see if there are any vagrant birds around this migrant trap at the Machico River mouth before returning to the hotel. After sunset we will visit Garajau to listen to calling Cory’s Shearwaters and maybe even Band-rumped Storm-petrels as they return to their nests on the sea cliffs. If we are lucky we may also see a Barn Owl of the endemic schmitzi sub-species. Day 5 Afternoon are the best time for pelagics around the island so, after lunch, at around 15.00, we will board the 11-meter rigid-hulled inflatable boat Oceanodroma. During the afternoon and the evening we will drift and chum in search of both Zino’s and Fea’s Petrels (hopefully side-by-side for comparison) amongst the commoner Bulwer’s Petrels. Cory’s and Manx Shearwaters should also be present in good numbers. Sandwiches will be served on board and we will return to harbour between 21:30 and 22:00. Day 6 Again, the morning will be free with lunch taken at the hotel and we will board the Oceanodroma at 15.00 for another pelagic. This time we will be searching in different areas mainly for storm-petrels with both Band-rumped and White-faced Storm-petrels being high up on our lists. Barolo Shearwaters are rare but this is a species we will keep looking for on these pelagic expeditions. There is also a chance to see Wilson's Storm-petrel as it is a common visitant to Madeiran waters. Again, sandwiches will be served on board and we will return to harbour by 22.00. Day 7 Following the usual pattern, the morning will be free with lunch taken at the hotel and we will board the Oceanodroma again at 15.00 for our final pelagic. This time we will be searching for species we may have missed on previous sailing and once again sandwiches will be available on board and we will return to the harbour by 22.00. Day 8 The morning will be spent at leisure or, if there is any important land bird species still not seen, we will have the option to look for them again. After lunch we will transfer back to the airport for the return flight to London at the end of the tour. The climate is generally warm and sunny but it can be cold and cloudy with drizzle in the mountains. A sun hat is important together with some warm/waterproof clothing for the mountains and boat journeys. There are no special health requirements. The pace of the tour is generally relaxed with only a limited degree of fitness required with the exception of the night-time mountain walk to look for Zino’s Petrel, which is quite strenuous. An 11-metre RIB is used for the pelagics as standing on deck on fishing boats is inherently dangerous and they are not as manoeuvrable. 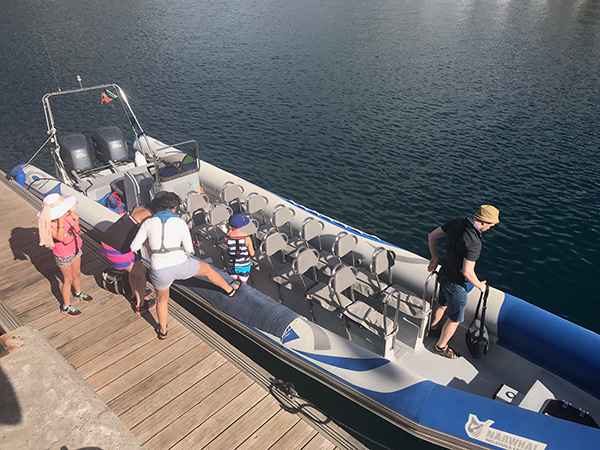 Our boat meets international safety standards for oceanic waters but waves of up to three metres are possible so it is advisable to bring sea-sickness tablets. There is a toilet on board for ladies use mainly as it is easier for men to use a bucket! Group Size Minimum number for tour to go ahead: 4; maximum group size: 8 with 1 leader, 14 with 2 leaders. Maximum number on the extension 12 (the boat's capacity). Price includes flights between London and Madeira, all land transport and boat trips within Madeira, half-board accommodation in a medium-quality hotel with private facilities, picnic lunches and guiding services throughout. Excluded are the remaining lunches, drinks, gratuities, insurance and items of a purely personal nature.